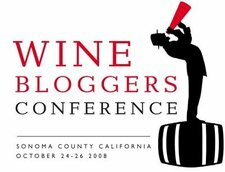 Many of you already know about this (and I've mentioned it in passing before now) but I'll be heading to the left coast in a little over a week to attend the first annual Wine Bloggers Conference in Sonoma County from October 24-26. It promises to be a great opportunity to meet bloggers, in person, that I've built friendships with over the years and also interact with members of the wine industry who are interested in what the blogging world can and does mean for them. In addition to enjoying the meals, tastings and discussions, I'll be pouring (along with Finger Lakes contributor Melissa Dobson) Dr. Konstantin Frank's 2006 Rkatsiteli as a part of the live blogging portion of Friday's schedule. Fred Frank is a one New York winery owner who really seems to 'get' the power and potential of blogs and he purchased this spot in the live blogging tasting. I was happy to volunteer to pour and discuss the wines with participants. 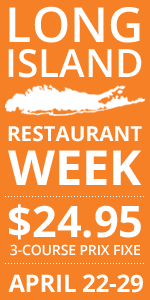 That Rkatsiteli is far from the only New York wine that will touch bloggers' palates over the three-day conference however. 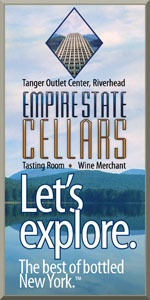 Several Long Island and Finger Lakes wineries are arming me and Melissa with wines to pour at one of the informal (but still organized) gatherings outside of the official program. Once all of the wines are compiled, I'm going to publish the list of wines we'll be offering. There will surely be more posts on this as it gets closer. Stay tuned.